For those of you like me, who have every Maybelline Colour Tattoo in existence, are hooked on creme eyeshadow bases but daren't spend more on MAC. Then these little guys, B. 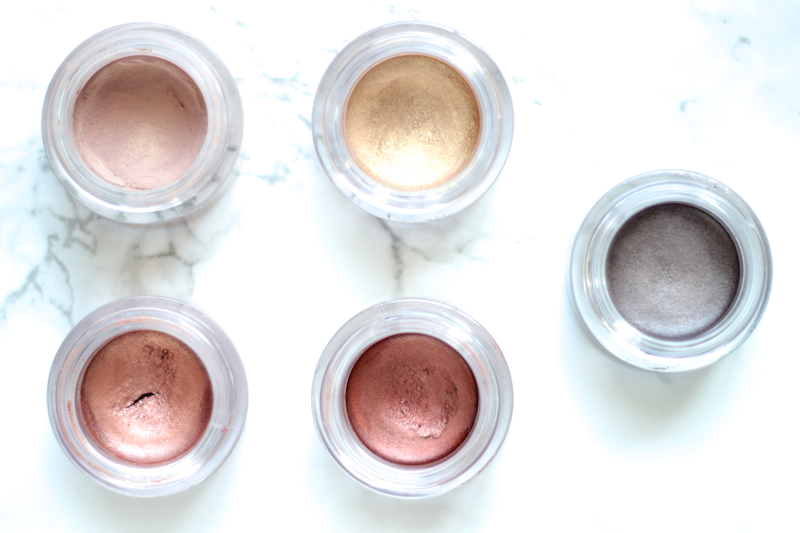 Stunning Vibrant Eye Shimmers, are where it's at. The five you see here are my staple neutral shades, they're the everyday, one-colour, 10-second wash of colour or, for something a little more complex make the perfect eyeshadow base. Lizzie, a shimmery version of MAC's Painterly Paint Pot, makes the perfect no-makeup makeup as it covers areas of discoloration - read: too many late nights - and those dastardly purple veins. Plus it's perfect for fairer skin. Golden Sand is beautiful and boasts a lot more tone dimension than Maybelline's Eternal Gold Colour Tattoo. It gets reached for in my collection a lot more frequently (or am I just justifying having two?). Copper and Bittersweet are very similar shades that, when blended out with a warm eyeshadow in the crease and a little under the eye make the perfect grunge look. Rockstar all the way over on the right is my newest addition. I don't usually go for cool toned shadows across my lid but, if you're looking for a smokey eye in seconds, day-to-night kind of vibe then this is your guy. Add a dash to a blending brush and 'windscreen wiper it' into the crease. At £6.99 they are a wee bit more expensive than their cheaper, larger, prettier and just generally favoured Maybelline counterparts. But more often than not they're on buy one get one half price at Superdrug or frequently on sale at the end of the season to make way for new shades. Imo, they're more of an extension of my creme eyeshadow phase due to their differing shade range, than the core of it. But definitely worth a look into if you're looking to expand. Youtube | What's on my iPhone?